In a previous post, we have explained how we collected a list of about 1000 articles related to climate change, and presented several measures of the associated discussions. Here we want to study the network of hyperlinks between these articles. More specifically, we build a graph in which each article is a node, and a directed edge connects node A to node B if the corresponding articles are linked, i.e. if article A contains a link to article B. As in Wikipedia each article represents an encyclopedic entry, and thus an entity, each link can be interpreted as evidence of a relationship between the entities which are the subjects of the articles. Following this idea, for example, the network of hyperlinks betweeen biographies in Wikipedia can be interpreted as a network between notable persons and historical characters, as shown in Aragón et al. (2012). 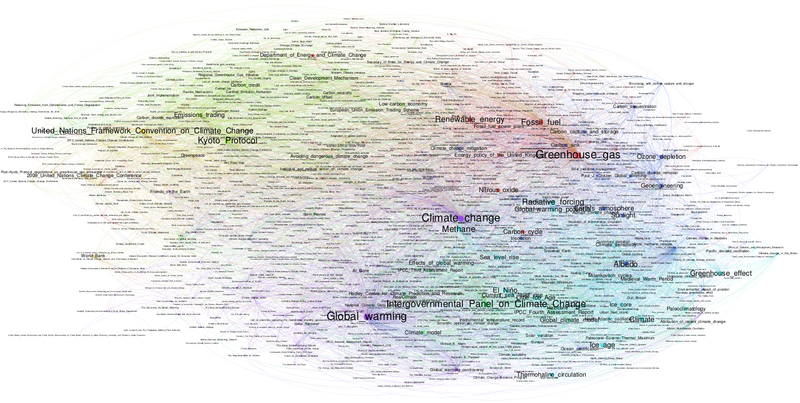 In the present case, each article represents an issue, an event or an actor related to climate change, and the network can reveal how these entities are related to each other according to the Wikipedia community. In this figure, drawn with Gephi, the size of each node depends on its pagerank. Colours have been assigned to nodes and arcs according to a clustering algorithm (modularity maximization), so it is possible to get an idea of the main groups (clusters), in which articles are strongly interconnected. To better visualize the network, you can download the pdf version (searchable). On the bottom-left of the figure we observe a purple cluster which includes articles Global warming and Climate change and is mostly focused on the scientific debate on climate change, and the associated controversies and actors (e.g: Global warming controversy, An inconvenient truth, List of scientists opposing the mainstream scientific assessment of global warming, Al Gore). This cluster has no clear boundaries and is strongly interlinked to a turquoise one on the bottom, focused on global models for climate, and centered around the Intergovernmental Panel on Climate Change. If we keep moving towards the right, we can see a cyan cluster grouping articles associated with climatology and the effects of global warming, such as Ice Age, See level rise or Greenhouse effect, and a dark blue one mostly related to Climate change mitigation and Geoengineering. On the top we can distinguish two clusters related to energy and climate change: a red cluster on the right, centered on Greenhouse gas, Fossil fuel and Renewable energy, and a green cluster on the left, associated to the Kyoto protocol and policies for emission reduction. Close to this we find the last cluster (mustard, on the left), grouping articles related to international treaties and conferences on climate change (the most relevant one appears to be the United Nations Framework Convention on Climate Change) and more in general Individual and political action on climate change, including some relevant actors such as the World Bank and Greenpeace. Beyond showing how articles can be grouped into different clusters, the figure also reveals which articles are more relevant in this network, according to the pagerank. In order to investigate further which are the most relevant nodes in the network, we will apply and compare several centrality metrics in the next post. Aragón, P., Kaltenbrunner A., Laniado D., and Volkovich Y. (2011). WikiSym ’12 – 8th International Symposium on Wikis and Open Collaboration. The London workshop will not start until next Wednesday, but I already want to express great satisfaction for process that led to this event. In a handful of months, we identified a number research questions, we collected and analysed the data necessary to provide some answers, we visualised the results of the analysis and we are now ready to share our maps with a real public. On a small scale, we already proved the worth of our consortium. And there’s more: next week event is only a small test compared to the exhibition we will organise in London in the next fall, which in turn is only a small test of the online/offline platform we will develop on climate adaptation. During the kick-off meeting, I said that our project is complex because it is experimental. I think we have found the good organisation to tame such complexity. The circle displayed in the image below (courtesy of Axel) describes the iterative process of questions-data-visualisations-tests that characterize EMAPS. What is most remarkable about this circle is that it reaches further every time we go through it. 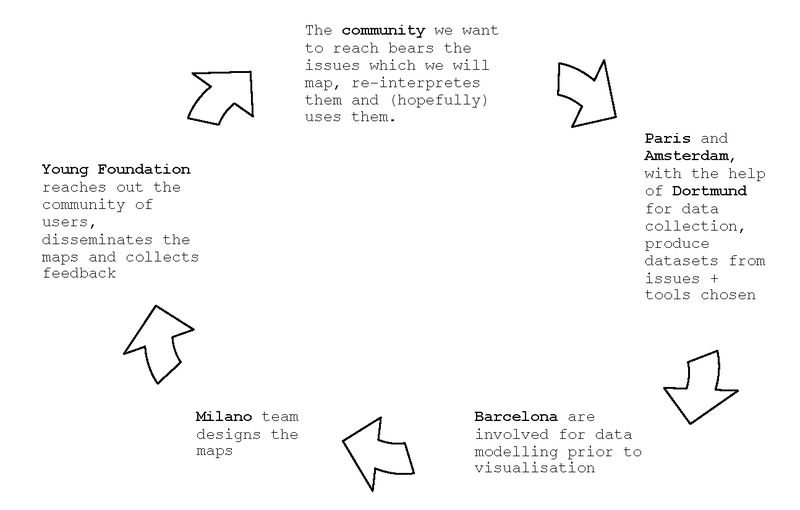 More then to a circle, our project resembles to a spiral where every coil delivers better maps and engages more people. Acknowledging the spiralling nature of EMAPS transforms slightly but decisively the goal of the second day of our London meeting (see page 7 and 8 of the survival kit sent by Axel). At this stage, the priority is not to decide once and for all the precise focus of our project, but to set the mapping spiral into motion. What we need is to identify a first set of adaptation maps that are both interesting and relatively easy to produce. To facilitate our work, I drafted a list of potential research questions and maps (see page 10-12 of the kit). Our goal for Thursday is to complete this list (because I certainly forgot something important) and agree on the interest and feasibility of each of the proposed maps. To develop new ideas, it can be worthwhile to look into the past for inspiration. Visual representations have played a role in conflicts, controversies, and power struggles over the course of history, but these roles have varied from case to case. This presentation is a loose collection of commented images from the last 1000 years that stand as examples for the complex relationship between conflict and visual portrayals of many different kinds. 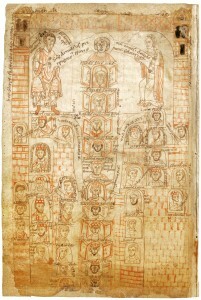 Many of these images are not only original in terms of visual technique but also in how they related to their subjects and how they try to intervene. © 2012 EMAPS | Powered by WordPress | Theme 'Sirup' by 1000ff | 45 queries 0.239 sec.